Women still hide behind the tabooed cloak thinking that abortions are illegal or morally wrong. This is not surprising as women are regularly shamed for wanting rights over their bodies. I want to ask – “How many of us think of consulting an OB-GYN for an abortion?” For most women and girls, popping that infamous abortion pill seems so much easier and so very confidential. Myths and stereotypes on abortion arise from lack of education. As the outset, the key is to spread the word. Knowledge and education related to a woman’s reproductive health must reach every girl through correct channels. Abortion is legal and there’s nothing wrong in wanting an abortion. A woman, over the age of 18, doesn’t require consent from anyone when opting for an abortion. If she’s within 12 weeks of her conception date, she can approach her gynaecologist and request for an abortion. Between 12 – 20 weeks, two practising gynaecologists have to provide a conclusive diagnosis before giving the go-ahead for an abortion. Unsafe abortion is another common occurrence. Battling dilemma and meeting resistance at all forefronts, women often delay the procedure. Thus, making abortion unsafe in many cases. 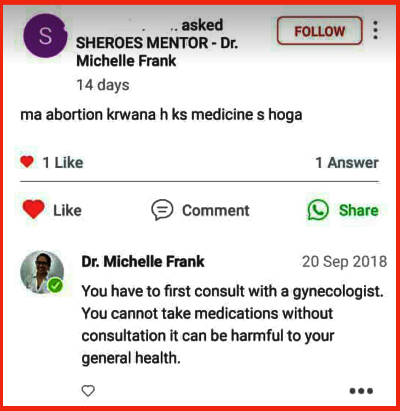 As a medical consultant with SHEROES, I encounter several queries in SHEROES Health Community where community members ask about ‘homemade’ abortion solutions. Such queries stem from the fact that these women can’t visit a doctor by themselves, or are afraid of being judged by society or medical professionals. They’re raised or treated as dependents. This ingrained dependency compels them to think, they need permission to conduct procedures on their bodies. An absolutely wrong notion! Most Indian girls are raised to believe, that her body is her husband’s possession and she is responsible for upholding the honour of her family. No wonder, procedures like abortion and contraception are hardly her choice. Her decision or will is ignored. It’s evident that the problem lies in a girl’s upbringing and the stigma around abortion. While these won’t change overnight, I believe, talking openly about such issues is the first step towards empowering women. On the SHEROES app, women are doing just that – talking, sharing and supporting each other on abortion and other intimate problems. We need such non-judgemental spaces for women, which give access to a wide knowledge base, plus provide freedom of expression. As a healthcare professional, I want to highlight how the dynamics between doctors and patients are evolving. 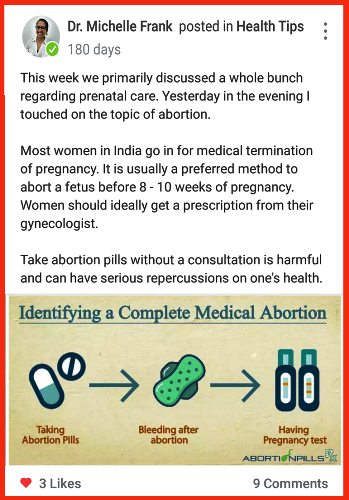 Today, doctors are becoming more sensitise and creating their own safe spaces for women seeking abortions, especially in urban areas. This doesn’t hold true for the women in rural areas who find it a struggle to face alleyway abortions using unsterile practices amidst suffocating judgemental spaces. These unheard voices warrant a sounding board on topics like abortion. Let’s drop our judgments and prejudices at the door and take progressive strides. Women can be allies for other women in advocating women’s abortion rights. For me, the actual accomplishment will be, when women won’t hesitate to get an abortion done and consult an OB-GYN before an abortion. Letting a woman own her right over her body and respecting her decisions are stepping stones to many great and challenging battles that lie ahead.